Today bloggers are talking about special people they know and love! Why? Because we’re celebrating Joanne Lewis’ and Amy Lewis Faircloth’s award winning debut novel Wicked Good, which is all about a very special love between mother and son. 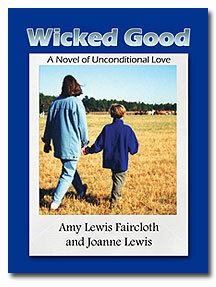 Wicked Good (Telemachus Press, LLC, 2011) is a special kind of love story. When Archer Falcon’s adopted special needs child decides to search for his birth parents mother and son embark on an adventure and a mystery that will both test their love and bring them closer. The blogs listed below have agreed to share their stories, essays, poems, photos, or other means of creative expression on the topic of special people we know and love. Like any good adventure, we have no idea what’s in store but we can’t wait to begin! The only guidelines we provided were to write about special people we know and love…open to interpretation. What we do know is that these are all fantastic blogs and each time you visit a blog on the list you can enter to win a copy of Wicked Good. So let’s go visit all our friends listed below and don’t forget to invite all of the special people in your life to come along! We want to thank to all of our blogging friends for participating in this special day; Amy and Joanne thank you as well. In the post below, Amy and Joanne share their own thoughts on the Wicked Good People that they know and love. Our adventure begins now. Visit these amazing blogs to read about all the Wicked Good People in our lives. Get ready to laugh, cry, and be amazed. See you on the blogosphere—and remember to celebrate the special people in your life. This is such a great way to share with each other about all of the Wicked Good people in the world! Thanks, Margo! Added you to the list and updated other links. :) Love your post about Made by Survivors! WOW - for sure! The posts are all wicked wonderful. Thank you to everyone for participating. Hey Robyn! This is the best! I am so enjoying visiting everyone and leaving comments! Thank you for all you did to bring this into being!